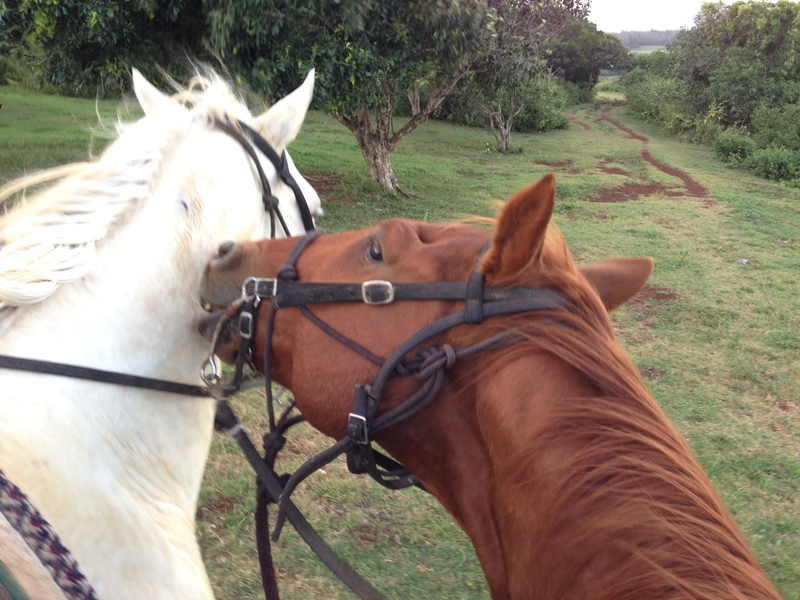 Gunstock Ranch, located on the North Shore of Oahu, is the only ranch, at least on this island, that gives customers who board their horses there the freedom to roam its 650 acres of Hawaiian hill and pasture at their leisure—for approximately the same price as it is to board anywhere else. The horses decided where we would be posing for pictures. How nice of them. 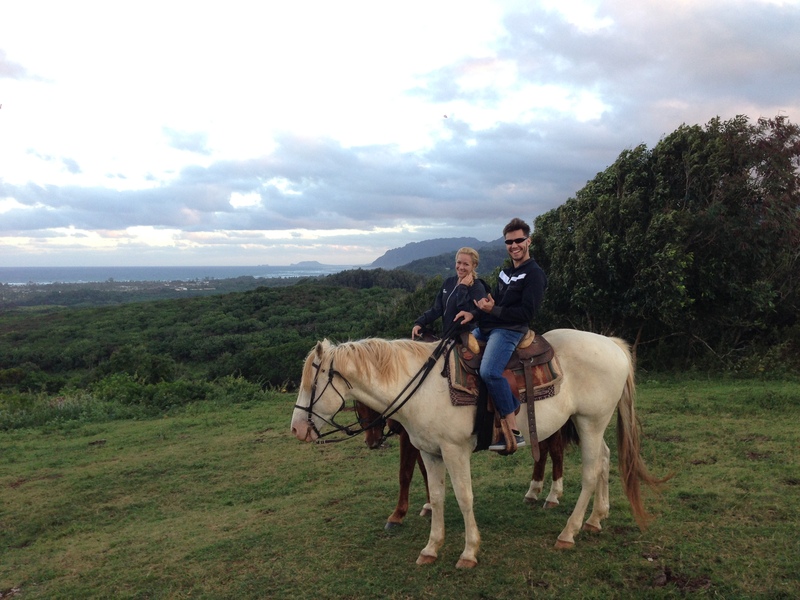 My man had never ridden a horse before and had a great time. I embellished my riding experience a bit—as I used to ride a lot when I was younger, but haven’t in a long time—and I had a few adrenaline-pumping moments when my horse would speed up to a trot and had me questioning my posting ability. Those several instances made the experience amazing—as did not being required to wear a helmet or walk in a single-file line (a requirement upheld by every other ranch I’ve ever visited). Our personal cowgirl, Lorrie Anne, a senior at a local high school, isn’t listed on the website, but she was born and raised on that ranch and had just come back from winning 1st Place at the national rodeo championships on the mainland. The first girl ever from Hawaii to win it! Knowledgeable and talented! 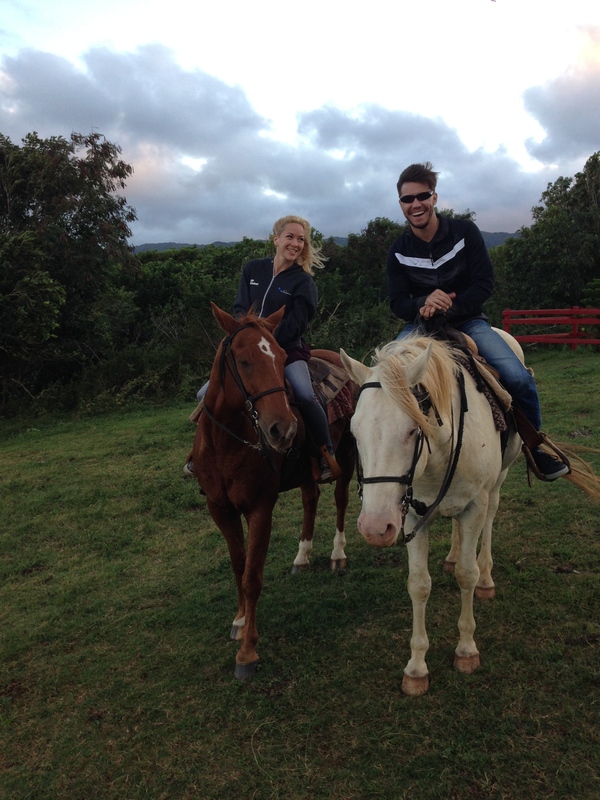 Serendipitously coupled with horses that matched our riding capabilities (and personalities, apparently). We could have taken more photos, but with his horse, Ghost, moving at such a slow speed, we spent much of our energy trying to encourage our rides with a bit of kicking and clicking in an effort to close the gap between our guide and us. Our horses were, as she guide put it, lazy. As we got to a decline, my horse began to pick up the pace, and when I showed her I was willing to let her jog a bit, we were on our way. Still, much time was spent trying to persuade Ghost to hustle his hooves a bit. We walked through a long trail between pastures and heard cool stories about how some of the animals were rescued or had gone through some ranch-animal-specific drama—an abandoned calf with an interesting disability, a survivor of a wild dog attack, and so on. When we weren’t talking about the ranch’s residents, we were soaking in the surrounding sights. We made it to the summit of our trail at a great time. The clouds, lit with a peach glow in the purple sky, had been spying on us from above the tree tops as we made our way up the hills and through the canopied brush—and when we emerged, it was all we could see in every direction. A panorama would’ve been a great idea. Looks like someone was harboring some unfriendly feelings. The major benefit of this dream date, as I hadn’t been on a horse in ~15 years, was to inspire me to get back on regularly. It’s a bit of an expensive hobby for now, but it really is fun. Maybe one more trip back will have me committed and signed up for regular lessons. 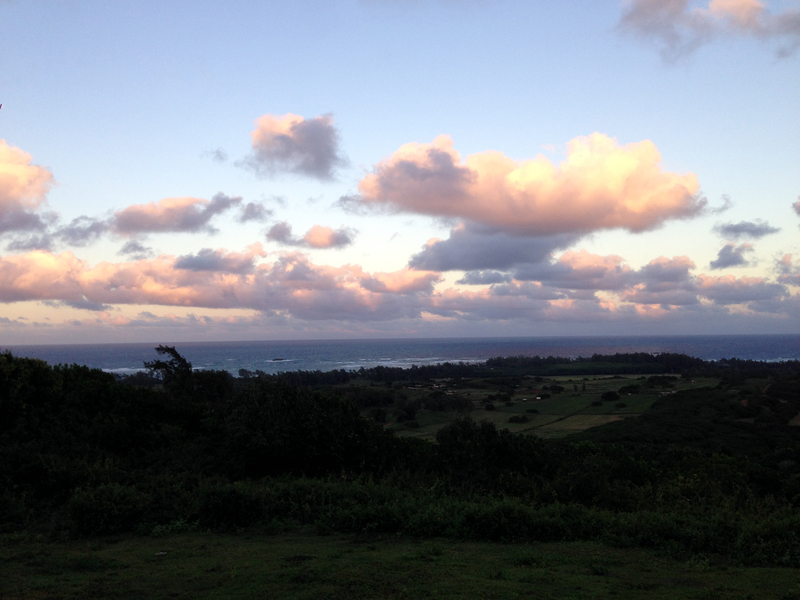 I can’t imagine a better feeling than riding through 650 acres of Hawaiian island freedom. Visit Gunstock Ranch online. 808-293-2026.